Citation: C N Trueman "Guy Gibson"
Guy Gibson, centre of photo, led the legendary Dambuster Raid – ‘Operation Chastise’ – on the Ruhr’s dams. Here, using the ‘Bouncing Bomb’ designed byBarnes Wallis, Guy Gibson’s 617 Squadron of Lancaster bombers achieved their mission of destroying two dams and temporarily flooding the Ruhr industrial zone. For his role in the mission, Guy Gibson was awarded the Victoria Cross. Guy Gibson was born in India on August 12th, 1918. He moved to Cornwall aged three in 1921. In 1936, Gibson joined the Royal Air Force and when the Second World War started in September 1939, he was a bomber pilot with 83 Squadron. At this time Gibson, along with many bomber pilots, flew the Handley Page Hampden. 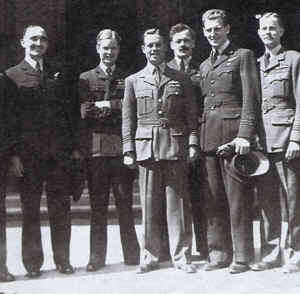 Gibson quickly gained a reputation for his flying skills and in July 1940 he was awarded the Distinguished Flying Cross on the first raid carried out by Bomber Command. Gibson then transferred toFighter Command and flew as a night-fighter in the Beaufighter. He claimed four kills in ninety-nine sorties and was awarded a bar to his DFC. Gibson was promoted to Wing Commander and returned to Bomber Command in 1942. He commanded 106 Squadron and flew Lancaster bombers. He built on his reputation as a highly competent pilot but Gibson also developed a reputation as a hard taskmaster who only ever expected the highest of professional standards from all who worked for him – both air and ground crews. In 1943, Gibson, still only twenty-four, was given command of the newly formed 617 Squadron. The task of this new unit was to attack and destroy the five dams in the Ruhr. This was a highly specialised mission and only the best air crew from Bomber Command were selected for 617 Squadron. The squadron had to practice low level bombing runs over water that would eventually have to be done at night. Such training was dangerous and became even more so when the crews were told just how low over water they would have to fly their Lancasters. The bouncing bomb had to be dropped at just sixty feet above water from a specific distance from the dam. The pilot had to fly the bomber at exactly the right height and speed while the bomb aimer had to calculate the exact time that the bomb had to be dropped. If the plane was going too slow or too fast or too high, the bomb would either overshoot or not bounce over the nets that protected the dams. The raids on the dams took place on May 16th, 1943. The Moehne and Eder dams were breached but at a cost to 617 Squadron. Only eleven bombers out of nineteen survived and fifty three crew members were killed. The raid was considered to be a major success and much valuable wartime propaganda was made of it. Gibson was awarded the Victoria Cross for his part in the raid – not just for his leadership but also for giving fire cover to other Lancasters after his plane had dropped its bomb. This required him to bring his Lancaster around and face the full fire power of the Germans protecting the top of the dam for a full thirty minutes. Guy Gibson became a household name after the raid was publicised. After the raid, the government did what it could to protect someone who had become famous for his bravery. Gibson was sent to America on a lecture tour. One of his tasks was to inspire American bomber crews who had returned to America after a tour of duty – twenty five bombing raids. In one question and answer session, Gibson was asked how many operations he had been on. Gibson replied that it stood at one hundred and seventy-four. However, lecturing was not in Gibson’s blood and he pestered Bomber Command for a return to operational duties. He got his wish in 1944. On September 19th, 1944, Gibson along with his navigator James Warwick, was killed flying a Mosquito over Holland. Subsequent investigation of the wrecked Mosquito showed that his plane had not been shot down but as a result of a faulty fuel selector tank, he had simply run out of fuel.